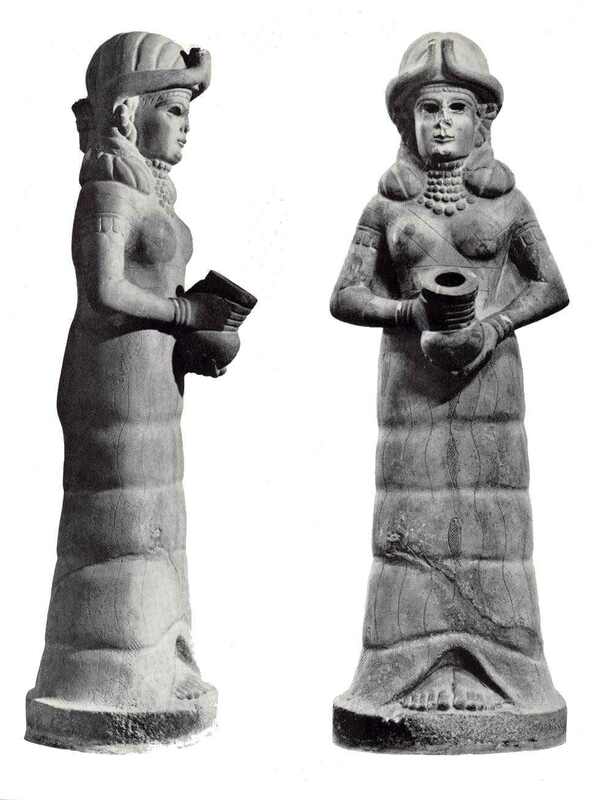 The statue of the Lady Ninkharsag (mama in Accadian) in the guise of the goddess of irrigation, found at Mari on the Upper Euphrates in Syria on display in the Aleppo museum. Water was channelled through her body and flowed from the bowl held by both hands to create a magnificent fountain at the heart of the massive Mari palace building complex. Originally dated to 1,800 BC, recent knowledge and dating recalibration suggests a date before 3,000 BC. With this Settlement will come prosperity; an enclosed Reservoir  a water trap  should be established. The good land is full of water; because of the water, food will be plentiful - Ninkharsag: Kharsag Epic No.2. Kharsag, translates to head (sag) enclosure (khar) and represents the location of the Sumerian creation story, which suggests a restart of civilisation around 8,750 BC, following global catastrophe, at the Kharsag (Garden of Eden) site in Southern Lebanon.